This is part 1 in a series of blog posts to highlight the work of our Teaching & Learning Innovations team. Each team member was asked to write a post about the work of one of their colleagues. When I first met Megan Eberhardt-Alstot and asked her about her work, a smile lit her face as she told me emphatically that she had, in her words, “won the job lottery.” As I have come to know her over the past year, it is clear to me that she shares a sentiment that seems infectious in all of Teaching and Learning Innovations (TLI): she looks forward to coming to work each day and almost can’t believe that she gets paid to do a job she loves so much. You may already know Megan if you teach an online, blended, or face-to-face course with online components. She is a Learning Designer for TLI, and she has helped many instructors learn how to teach online, as well as to recognize and address the chasm of difference between online and face-to-face teaching and learning experiences. But, Megan is so much more than her job description. Megan was an invaluable team member in helping make the CODEL Doctoral program the success that it is! Her energy and passion for finding the best possible learning and teaching solutions for our students and faculty are difficult to match…Megan has been at the heart of preparing our CODEL instructors for effective online teaching through her individual mentoring sessions, OTPP, and with workshops at our annual Faculty Convening where best practices are shared by instructors from both campuses. Additionally, Megan took the lead role in identifying how our program could effectively offer a virtual Qualifying Exam using technology we already possessed, as opposed to acquiring new software applications or services. The process she identified has been hugely successful for the first two administrations of the annual high-stakes exam. Beyond that, though, she built relationships with people and helped develop a positive, human-centered, program culture. That is what makes Megan unique and special, and it is something that she continues to do in her current role as a Learning Designer. Assembled a fabulous team of Course Reviewers in support of CSUCI and the CSU Quality Assurance efforts in online teaching. Continued to facilitate the first course in CSUCI’s Online Teaching Preparation Program (OTPP), called Humanizing Online Learning. Collaboratively designed, piloted, and launched Learning Online 101, a self-paced online course for students to develop requisite tech knowledge, skills, and practices for success in postsecondary online courses. Even with all of this, Megan is just getting started. Her impact will be great as more departments aim to adopt and redesign online courses and programs, and as more faculty are motivated to work with a design team to produce high quality courses that meet a growing need across campus. At the Fall 2018 Convocation, President Beck presented a message that struck a chord with Megan and speaks to a philosophy that she frequently cites in conversation with her TLI colleagues–that education has the power to change family trees. As online and blended learning opportunities offer affordances that support this vision, Megan feels a sense of personal responsibility to our students and faculty. Megan thinks she won the job lottery, but CSUCI won when Megan joined the team. 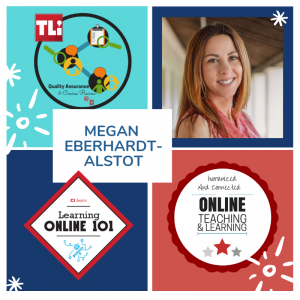 If you teach (or want to teach) an online, blended, or face-to-face course with online components and you don’t yet know Megan, then come on by! Megan is so easy to work with and has amazing, creative ideas! Plus is Google and digital tools guru! Megan was and is a blessing! She helped me over the threshold into the realm of online education with her warm disposition, get-it-done attitude, and wealth of knowledge. She’s my online hero!